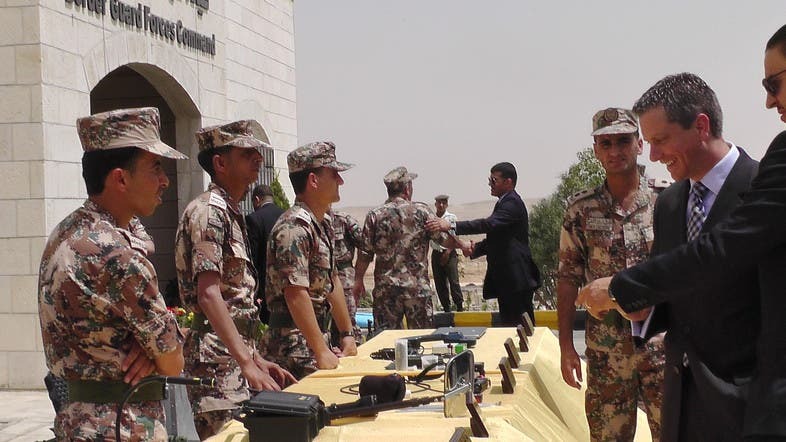 Jordan's military on Monday unveiled a new phase of a border surveillance system that U.S. officials say provides an effective defense against infiltration attempts, including by Islamic State militants. The kingdom plays a high-profile role in the U.S.-led military coalition against the extremists, who control large parts of neighboring Syria and Iraq. Militants pose a potential threat to the security of Jordan, a staunch Western ally, and previously have attacked border points. The border security system, partially funded by the U.S., includes radar and surveillance towers that enable Jordanian forces to spot suspected infiltrators several kilometers (miles) before they reach the border, said Col. Robert Paddock, defense attache at the U.S. Embassy in Amman. "Here, they can see anywhere along the entire border, what is going on, and then they can take appropriate action," Paddock told The Associated Press at the command center. With the completion of the second phase, marked by Monday's event, the system now operates along all of the Jordanian-Syrian border, Paddock said. Work along Jordan's border with Iraq is underway and is to be completed by the end of the year, he said. Alice Wells, the U.S. ambassador to Jordan, said the surveillance enhances Jordan's security significantly. "I don't think anyone is talking about an invasion of Jordan (by the Islamic State of Iraq and Syria (ISIS) militants), but what we are talking about is the ability of individuals to try to infiltrate the border and this is a highly effective defense against that," she told the AP. Sunday night, Jordanian border guards shot and killed two suspected infiltrators from Syria, the state news agency Petra said, without elaborating. The eastern side of the Syrian-Jordan border also has become the main pathway into Jordan for Syrian refugees fleeing four years of civil war. Human Rights Watch said last week that Jordan has gradually tightened entry restrictions over the past two years. Jordan says it has worked out entry procedures with international organizations and, in principle, maintains an open border.